When you shop, eat, drink or access our professional services, you can proudly say you're doing more than buying what you need. You're promoting a truly community-based retail development founded on the principles of sharing wealth amongst members and promoting good works. Carrot Common is a corporate & community business partnership for social good. Carrot Common is a thriving neighbourhood shopping mall, completed in 1988, and located in mid-town Toronto adjacent to Greek Town. It is owned by Carrot Common Corporation, a unique partnership that is structured as a joint venture with the following partners: The Big Carrot, Carrot Cache Community Resources, David & Margaret Walsh, CarrotSocial Justice Fund, Citizens for Public Justice, St Joseph Community Ventures. This partnership owns Carrot Common mall which includes 11 stores; 10,000 sq. ft. of office space, common areas; and 40 parking spaces. The mall has a central courtyard which is a very popular neighbourhood gathering space and a busy pedestrian area close to the Chester subway station. The ownership of the development is held so that over 40% of its profits flow to community-based organizations, 30% go to Carrot Cache, a non-profit corporation set up to fund new cooperatives and small organic farming projects, 10% to the Carrot SocialJustice Fund and Citizens for Public Justice. Carrot Common has been a successful venture since 1987. The operating success of the project has been due in large part to the nature of The Big Carrot and its role as an anchor in the mall while the work of the developer has been important in the management of the mall. The community groups benefit as they share in the profits. The community funds support small organic farming & food initiatives and social justice causes, with an emphasis on start-ups &small projects. The partnership began when The Big Carrot approached David Walsh for help in purchasing a car dealership site located across from their previous store. The partners set out to develop the concept of the mall with the idea that Walsh would raise most of the monies and act as the developer, and at the same time consult closely with members of The Big Carrot on how the project would proceed. The form of the partnership was not defined entirely at the beginning, but rather it evolved over a period of two years as the project came together.For example, Carrot Cache was not formed until two years after the project began, and its mandate evolved for another two years. David Walsh was attracted by the community spirit of The Big Carrot and realized it would make an excellent anchor for a neighbourhood shopping mall. He was also interested in ways the project might support other community causes. The large courtyard between the stores has been a big asset to the neighbourhood as a community gathering space. The BigCarrot Natural Food Store, the anchor store in Carrot Common, was founded in1984 as a worker co-op. The founders had established a very successful store across the street from the present location, and after three years were interested in expanding, which made Carrot Common possible. The Big Carrot has made two major expansions to its original retail space that resulted in increasing the size of its original store by 40%. 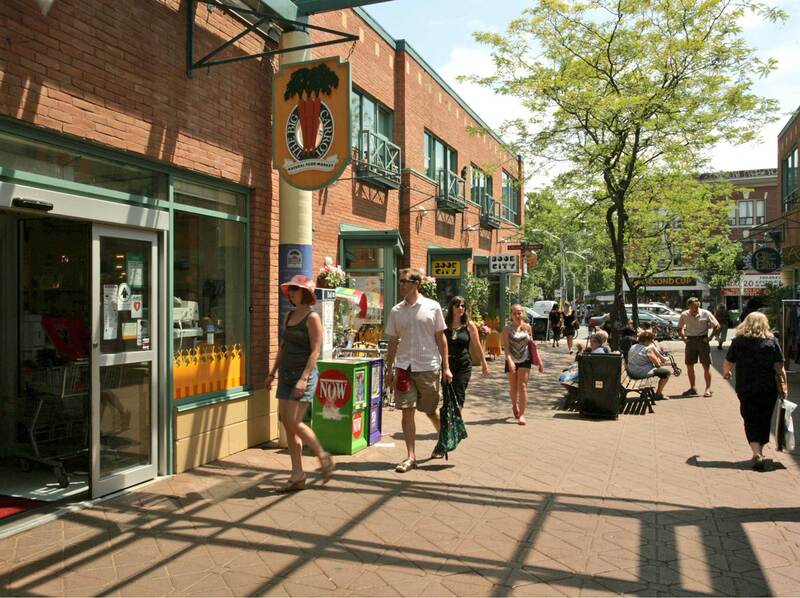 The ground floor retail also has a number of other successful "alternative"stores, including the Big Carrot Juice Bar, Aroo Natural Clothing, InspiredLife, Erietta’s, SNUG, Guzel Light, Gifts of the Earth, as well as Book City, a popular book store. The second floor of the East and West buildings has been developed as a natural health & wellness centre with over 85 therapists and counselling practices. A large roof deck with 8,000 sq.ft. of gardens is available to community groups to hold social and fundraising benefits. Members of local community groups participate in harvesting the produce from the gardens. While many commercial real estate developments have faced difficulties during recessions, Carrot Common has thrived. The character of the development gives it a unique relationship with the community, and it is much talked about as an alternative to standard shopping malls. Carrot Common is a demonstration of how different types of partners can successfully create a project that can have community development as one of its major goals, and at the same time build a successful business venture and promote organic foods. The real benefits will become more visible in the long-term when the project generates higher profits to support community economic development and other social justice causes. The partners are continually examining ways of using the property for innovative ideas, such as the initiative to create an extensive green roof that attracts many visitors.